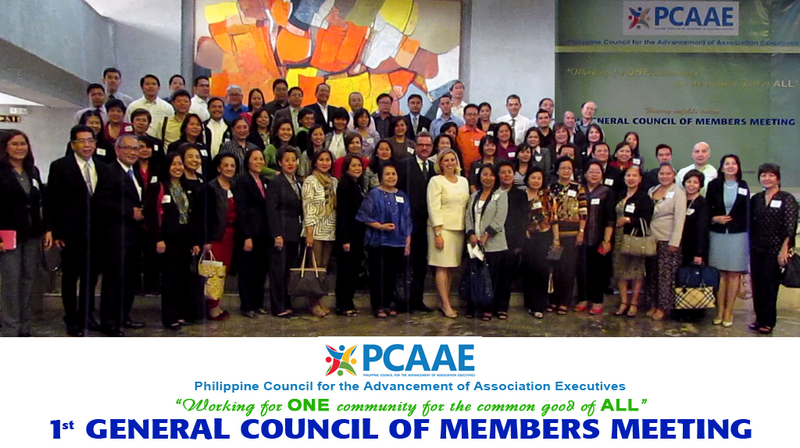 The newly-formed Philippine Council for the Advancement of Association Executives (PCAAE), www.pcaae.org held its 1st General Council of Members meeting on January 30, 2014 at the Philippine International Convention Center (PICC). A hundred “founding members” attended the event and shared their plans and aspirations for the new organization. PCAAE is currently the only national society of professionals that serves membership organizations and those who manage business, trade, philanthropic, scientific, medical, educational, technical, social welfare, agricultural and other non-profit organizations. The PCAAE was launched on November 20, 2013 during the 1st Association Executives Summit jointly organized by the Philippine Tourism Promotions Board (TPB), the PICC and the Association of Development Financing Institutions in Asia and the Pacific (ADFIAP). Together with the Washington, D.C.-based American Society of Association Executives (ASAE) and the Center for International Private Enterprise (CIPE), these five institutions are PCAAE’s “founding pillars” that support the ideals and goals of the new organization.